"Understanding what makes a thing difficult doesn't make it less difficult, and understanding how difficult it is can make it more difficult to attempt. Pictures do not get easier for me to make but more difficult. With each one, I learn more of what can go wrong, and I am thus more threatened. It's always satisfying when you can turn something that goes wrong into something that is even better. If I saw that an actor like Broderick Crawford was a little drunk on the set, I tried to make it part of the story. If someone has just had an argument with his wife, I try to use his upset state as part of his character. When I cannot correct the problem, I incorporate it." ...and so it follows that when Fellini was tormented by director's block in the wake of La dolce vita's colossal international success, he folded these troubles into his next film. 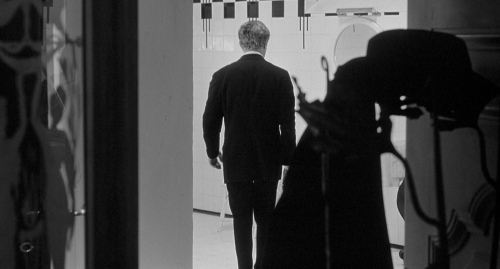 A gross oversimplification of 8½ is that it's recursively about the making of itself. 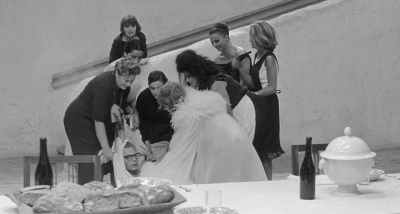 Director Guido Anselmi (Marcello Mastroianni) stands in for Fellini, emotionally drained and flailing around aimlessly as his next project looms in front of him. Guido has a crew toiling away on sets, he has a completed screenplay in hand, and though his producer is finding himself increasingly impatient as the months drag on, the expectation is that production will be in full swing any day now. The elements necessary to hammer out a film are in place; it's just that the creative spark Guido needs to propel it along is lagging. He's reluctant to admit defeat -- to reveal to the cast and crew relying on him just how barren the emperor's wardrobe happens to be -- hoping everything will manage to fall into place regardless or that the entire debacle will somehow fade out of view. no other reason than he can. In lesser hands, 8½ likely would've been a potentially compelling concept masking the hollow shell underneath. The cynical expectation may have been that Fellini was so creatively stifled that he relented into recursion -- a frustrated director faced with a troubled shoot making a film about a frustrated director faced with a troubled shoot -- but that's not at all the case. It's simply the springboard for one of the most visually arresting, wildly influential, and critically acclaimed films of the past half-century. declines to bludgeon any one point into his audience's heads, and this ambiguity is one of its central charms. He so freely alternates between fantasy, shadowy memories, and the present that they quickly meld into a single strange, wonderful world. On one hand, there's a drive to dissect and analyze what's unfolding on-screen -- even though like his avatar of Guido, Fellini himself doesn't necessarily have the answers for the questions he's posing -- yet on the other, it's all too easy to simply succumb to the thrall of its entrancingly surreal imagery. The recursively autobiographical premise is anything but a gimmicky crutch. The ordinary is instead a gateway to the fantastic; it's as if Dorothy were looking on as a seemingly unremarkable man pulled back the curtain to reveal Oz rather than the other way around. Guido may be standing in for Fellini, but while his counterpart is creatively impotent, Fellini ensures that 8½ is bursting at the seams with imagination. The screenplay for Guido's film is derided for its lack of any substance; 8½, on the other hand, is so lush with metaphors and meaning that it demands multiple viewings to be truly appreciated. This is a movie that rewards analysis and further discussion. Every time I watch 8½, I feel compelled to seek out additional reviews and essays that continually cast the film in a new light for me. Though many are quick to argue that La dolce vita is Fellini's true masterpiece, it's impossible to overlook the artistry, boundless imagination, and enduring influence of 8½. Yes, it's a self-indulgent spectacle, but this is also among the most masterfully crafted films ever produced. As frequently as its admirers have tried to imitate 8½'s interweaving of time, fantasy, and reality, it's yet to be truly rivaled. Even with the cinema's longstanding meta-fascination with itself, 8½ remains perhaps the most powerful movie about the filmmaking process. Visually entrancing, smirkingly satirical, and blending overt symbolism with more ethereal metaphors, this is one of those rare films that not only engages me on every level but whose thrall grows only more intense with successive viewings. Widely considered to be one of the greatest films ever made and indisputably among the most important, 8½ demands to be experienced time and again, and its spectacular release on Blu-ray is essential viewing for anyone fascinated with the art of filmmaking. DVD Talk Collector Series. 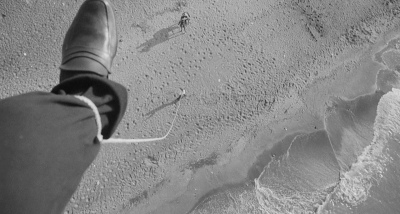 Though the presentation of 8½'s legendary opening sequence is somewhat underwhelming, I quickly found myself startled by how spectacular the film appears on Blu-ray. The screenshots scattered throughout this review hardly do it justice; the image is so teeming with fine detail, in fact, that I would occasionally be too distracted marveling at the clarity to read the subtitles and would have to rewind. This high definition remaster not only accentuates the detail and texture of the film but its inspired interplay of light and shadow. 8½ alternates between blindingly bright whites and sequences blanketed in shadow, and this Blu-ray disc reproduces that sort of contrast flawlessly as well as the many subtle gradations of gray in between. Once the fever dream of its opening sequence has come to a close, the image isn't marred by any wear or speckling of note. The image does suffer from somewhat of an oversharpened appearance, though, and there is quite a bit of ringing around high contrast areas. Black objects -- dark clothing in particular -- are consistently enveloped by a bright halo. That sort of electronic ringing is pervasive throughout the film and can be rather distracting. I can't recall any of Criterion's other Blu-ray releases to date suffering from this sort of flaw, and I would've happily awarded this disc a perfect score were it not for that. Though that edge enhancement certainly comes as a disappointment, I'm much too impressed by every other aspect of this presentation to consider discouraging cineastes from a purchase for that alone. 8½ is flawed but remains a more than worthy upgrade over Criterion's previous DVD release. 8½ is lightly letterboxed to preserve its aspect ratio of 1.85:1, and the film and its extras span both layers of this BD-50 disc. 8½ boasts uncompressed monaural audio in its original Italian, and this soundtrack is accompanied by optional English subtitles. Beginning with Guido pounding and clawing at a car window, I was immediately impressed by the clarity and distinctness on display here. This PCM track is impressively robust for a film of its vintage, and the rendering of its dialogue is consistently warm and clean throughout. Easily the highlight of this soundtrack is the diverse selection of music offered by Nino Rota, alternating between instantly familiar classical numbers, a hybrid of Raymond Scott's "Powerhouse" with whimsical circus oompah, and the sorts of whirring electronic tonalities that wouldn't have felt out of place on the soundtrack for Forbidden Planet. It comes as a mild disappointment that it's this music that shows more strain than any other element in the mix, but it's a strong effort just the same. 8½ was shot wild -- the dialogue heard in the film was recorded after the fact by entirely different performers, with some lines not even being written until photography was completed -- and viewers shouldn't be discouraged by the fact that the lip movements don't match the sounds lilting out of the center channel. The audio commentary aside, there are no alternate soundtracks or multichannel remixes on this Blu-ray disc. Subtitles are limited to English only, and there isn't a dedicated stream for the deaf or hard of hearing. Though all of the extras on 8½ are presented at either 1080i or 1080p, only a tiny handful are truly in HD, and the remainder have been upscaled from standard definition. Terry Gilliam Introduction (7 min. ; SD): Gilliam opens his introduction by noting how upon first experiencing 8½, he knew it was an accurate document of the life of a director well before he became one himself. From there, he notes the recursively autobiographical approach of the film, marvels at its iconic opening sequence, touches on Fellini's honest yet playful use of time, and briefly explores the role of women in both Fellini's life and Italian culture as a whole. Gilliam also draws parallels between himself and Fellini, such as how their backgrounds as cartoonists may have influenced the exaggeration in their films. It's a terrific introduction, although unlike the DVD release, there's no option to play this before 8½; it's only accessible through the extras menu. "A Director's Notebook" has been provided as well. Though "A Director's Notebook" has been digitally remastered and is presented in 1080p, it's difficult to recognize as high definition. Though presumably shot on 16mm, it looks more like a Super 8mm home movie, and the audio is rough to the point of being all but indiscernable at times. The Lost Sequence (50 min. ; SD): The second of the documentaries on this Blu-ray disc shrugs off a traditional narrative as well; archival interviews with Fellini and Mastroianni are overlaid on top of a montage of stills while the other speakers featured throughout are videotaped. 8½ was originally intended to come to a close with a sequence set on a train, but as Fellini's "assassin complex" prevented him from holding onto the inessential any longer than necessary, this footage has long since been lost. The scene has been reconstructed as best it can through a series of production stills, however, and the story of this funereal sequence is told by the surviving cast and crew. Intriguingly, not only has the finalé been lost to time, but even those who were there scarcely seem to have any memory of it. Along with observations of what this bleaker ending represents and how it clashes with the more optimistic tone of the scene in the finished film, the documentary spends a pleasantly unexpected amount of time focusing on the sound design Fellini insisted upon for the sequence. "The Lost Sequence" also casts a far wider net than its title might suggest. Fellini delves into his reluctance to philosophize his own work as well as his feelings that the critical response to 8½'s autobiographical nature is far oversold. "The Lost Sequence" is presented in its original Italian, and though it is subtitled, the text can be somewhat difficult to read at times. creative conceit, I couldn't say, but "Between Cinema and Concert" presents Rota as someone whose most every trace had entirely vanished from the face of the earth, leaving little else but his music. The documentary charts Rota's uneasy transition from a childhood prodigy into "The Prince of Film Music", and it also explores his classical compositions, his professorship, and his refusal to discriminate between entertainment and the staunchly serious. Rota's success with the iconic theme to The Godfather, his tendency to unintentionally recycle his own music, some of his key collaborations, and the mixed critical reception in his lifetime are also addressed. Like everything on this Blu-ray disc, really, "Between Cinema and Concert" is well worth taking the time to explore. "Between Cinema and Concert" alternates between German narration and largely Italian interviews, and it is, of course, subtitled into English. Interviews (61 min. ; SD): 8½ also offers interviews with Sandra Milo, Lina Wertmüller, and Vittorio Storaro. Milo paints a portrait of Fellini that focuses more intensely on the man rather than the artist. 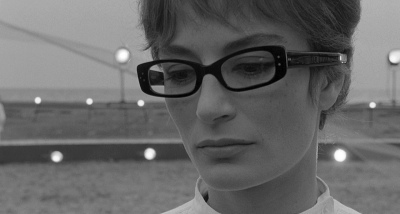 The parallels with 8½ are obvious; Milo's performance as the on-screen director's mistress mirrors her own relationship with Fellini that would last some seventeen years. The nearly half-hour long discussion is consistently engaging, touching on Fellini staging an impromptu screen test at her own home despite Milo having retired from acting as well as how the director's innate curiosity extended to the many women in his life. Lina Wertmüller made her way from an assistant director on 8½ to an accomplished filmmaker in her own right. In this seventeen minute interview, she too marvels at Fellini's boundless talent, his endearing cynicism, and a childlike joy of discovery that never faded. Wertmüller also explores Fellini's disinterest in being bound to decisions and viewing the printed page as purely hypothetical, the surreal cattle call of 8½'s casting, how he brought out the best in his collaborators, and, perhaps most memorably, his advice to Wertmüller as to how best approach directing. interplay between light and shadow...between the conscious and unconscious. Storaro's interview too runs seventeen minutes and is the only of the three to be conducted in English. 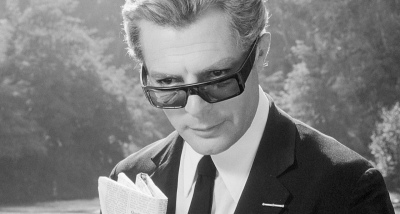 Audio Commentary: Originally recorded in 2001, the commentary track for 8½ has been culled from three separate sessions: an essay read by Tanya Zaicon, an interview with NYU film professor Antonio Monda, as well as additional comments by Gideon Bachmann, a film critic, documentarian, and friend of Fellini's. Though this pre-prepared approach inherently lacks the energy and spontaneity of a traditional conversation, this is an exceptional commentary nonetheless. It's very much a screen-specific track, and care is taken to avoid duplication in content across its different speakers. The commentary delves into the real-life inspirations for a number of the characters and situations featured throughout 8½, it takes the time to explore a number of the smaller performances, and Fellini's embrace of the surreal after emerging from the Neorealism movement is a frequent touchstone as well. Analysis of the film's themes, metaphors, and even its musical motifs is, not surprisingly, a dominant topic, from La Saraghina representing Fellini's appetites to a descent into Hell mirroring Dante's Inferno. I've long found myself fascinated by discussions of 8½ -- there's simply so much to explore and to interpret -- and I found this to be a particularly rewarding examination of the film. Still Galleries (HD): 8½ features two separate still galleries, both of which are offered at an impressively high resolution and in black and white. The first set of fifteen photos has been contributed by Gideon Bachmann. The more sprawling second, meanwhile, includes nearly a hundred images: primarily candid shots from the set but also what look to be promotional stills. A fair number of these photographs feature textual introductions to add some level of context. Among the highlights are an extended look at the unseen ending on the train and a visit by Sophia Loren to the skeletal spaceship set. Trailer (3 min. ; SD): The last of the extras on 8½ is a standard definition theatrical trailer. The handsomely designed, twenty-eight page booklet is bookended by excerpts from I, Fellini. In the first, Fellini playfully explains in his own words how the project gradually took shape and how a concept for a theatrical trailer took over as the ending of the film. The booklet comes to a close with Fellini touching on some of his philosophies of filmmaking, and though he doesn't mention 8½ by name, his comments about embracing problems rather than stamping them out applies wonderfully to it. In between are a pair of insightful essays penned by Fellini biographer Tullio Kezich and film historian Alexander Sesonske. Few films can claim to be as endlessly rewatchable as Fellini's 8½. 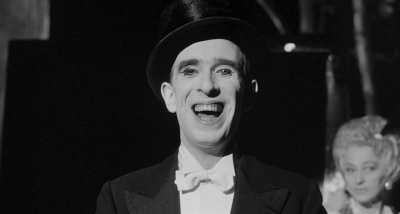 It's extraordinary even when viewed purely as a work of entertainment, thanks to its biting satire of the excesses of filmmaking and the entrancing thrall of its strange and wonderful imagery. Each successive viewing reveals more and more of the many layers lurking underneath, and this is what makes 8½ so truly rewarding to experience time and again. There's so much to explore: its deft interweaving of reality and fantasy...of past and present, its inspired use of light and shadow as a narrative device, the recursion of a film being made about itself, Fellini's skewed and hypocritical perception of women, and the discovery of hope in purity, even when it comes at the cost of abject failure. The list is neverending, and because Fellini didn't necessarily have the answers to the questions he'd pose -- uncertainty is a driving point of the film, after all -- a dozen people could devour 8½ and walk away with a dozen entirely different yet equally valid interpretations. Its intelligence, wit, and artistry have rarely been rivaled in the nearly half-century since 8½ was first released, and its enduring influence cannot be overstated. 8½ demands to not be passively watched but to be explored...to be discussed...and a single viewing isn't close to sufficient. Simply put, 8½ is an essential addition to the collection of anyone with a passion for film, and Criterion's release on Blu-ray is more than deserving of DVD Talk's highest possible rating. DVD Talk Collector Series.